Make sure you purchase quality products at the right price by buying brushed nickel taps from HC Supplies. We stock the most beautiful brushed nickel kitchen taps from the renowned manufacturers, Astracast. Their collection includes elegant brushed nickel taps in ornate styles with bridge, and dual tap options available. You may not realise just how affordable designer taps can be, but when you buy brushed nickel kitchen taps at HC Supplies you will benefit from huge discounts throughout the entire collection. Peruse the brushed nickel taps range and discover on trend options for your kitchen. Save up to 30% on all brushed nickel kitchen taps and get the kitchen you desire for less. Many other retailers sell brushed nickel taps at the recommended retail price, but we prefer to offer superior items at discounted prices in order to make then more affordable to our customerDo you need your new taps delivered as soon as possble? You can expect your new brushed nickel taps to arrive within 2 to 7 working days, and if you need them to arrive on a certain date, we can arrange this. Simply give us a call and we will make it happen. 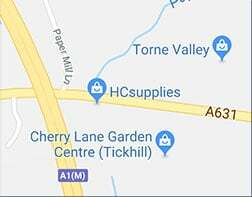 For a closer look at our range of kitchen accessories and fixtures and fittings, you can visit our showroom in Doncaster where are team of advisers will be delighted to assist you in anyway they can.